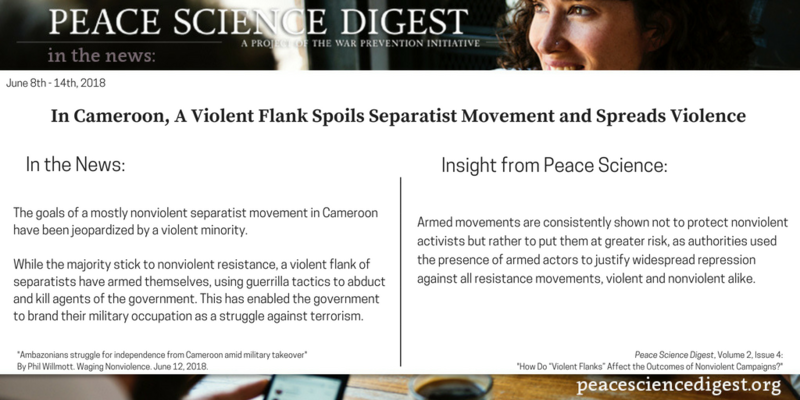 The goals of a mostly nonviolent separatist movement in Cameroon are being jeopardized by a violent minority. Peace research shows that these “violent flanks” often decrease the likelihood of campaign success and expose their nonviolent counterparts to violent retaliation. “Ambazonians struggle for independence from Cameroon amid military takeover” by Phil Willmott. Waging Nonviolence. June 12, 2018.